find out what the numbers are. they are using some substitution cypher. Webmaster: I tried matching some symbols too ... couldn't get very far. I'll keep looking for better references. OK This is looking more like early babylonian or Assyrian, but I'll be damned if I can't get ahold of any references that match the characters in this ad. than the fact that it comes from the CODE of Hammurabi. > you what the cuneiform mean. I'm not particularly an expert in cuneiform. > determine what it is saying unless we know the place it came from. > Sumerian, Hurrian, or Elamite. > http://www.sumerian.org/sumlinks.htm might also get you some leads. quote,  as are most of the other foreign phrases found on the May Day pages. fears death. It is upon this search that he meets Utnapishtim, the character most like the Biblical Noah. the ship landed upon a mountain after the flood. non-coincidental nature of these similarities. as anything more than shared mythology. clue:  Okay, I'll give it a go... In the top line, it appears that the first three are the numbers one and eleven 111.
this, I will send an update. wrote Prof. Heise (referenced in Resource 1, above) and asked him to take a look at this sample, but I received no reply. I agree that it looks like Late Assyrian (c. 650 BC) form of cuneiform. The Ugaritic script, like its Akkadian cousin, is written left to right. This is like English but the opposite of Hebrew which is written right to left. " which has been digitized and can be seen at http://cdli.ucla.edu/cgi-bin/Pget.pl?P=P109886. And those coordinates (17.50, 25.84) are in Sudan, NW of Khartoum. Not a clue for this page necessarily, but De Rebus is a South African attorneys journal. 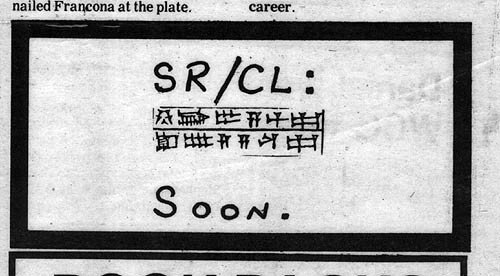 Some more comments on the August 24, 1981 "cuneiform ad". I've done some more investigating and there are a number of things that I want to point out. that would be applicable to this tablet is the Chicago Assyrian Dictionary, which was recently pointed out to Bryan by the freaks. can be divided into 5 barigs ( 60 liter)and a barig into 6 ban2 (10liter). So 5 gur+ 4 barig + 1 ban2 = 1750 liters. 4. Maybe 541/2834 was a useful phone number in 1981? Its out of service now. Or maybe it is a long/lat. larger amount. i take this as a shipment of fish in something, water, or sauce, possibly live fish. fish going where, and why? a paper dat gib aKcess to private collekshunz. Dis make a good point--ebybuddy an de outside figger a Freak iz a total OUTSIDER. God willin, dey keep thinkin dat way until THE GREAT DAY. Hance - this message was sent immediately after freaks#174 from an IP in Mexico. insist on Continental European connections, so their use of litres (if that is the case) would not be problematic. <<"And those coordinates (17.50, 25.84) are in Sudan, NW of Khartoum. or M5 or whatever would look there either. away. I'm wondering if the "Chinese" might be a later form of the same thing. Its cuniform text. Babylonian. BC. are key numbers used throughout the ADW announcements. is used in the announcements to reflect time, degrees, angles, and possibly other items. I'm leaning towards the number 144 being the KEY message in this announcement. Jerusalem, hence the word "Soon" at the end of the announcement. The Greek word for elect is "He Ekloge" which adds up to 144. Also, a disciple is known as "lamed"
disciples are also 12 lameds, or 12 x 12 = 144.
relates to Revelation 7 and 14. Break down the number to 4+3=7 and 3+4=7. Also, 7+7=14. no detective would ever believe that theory. suggest here might very well fall under that category. Daily Wildcat) will let you know that the U of Arizona doesn't own these books). far as I can determine, are meant to intrigue, perhaps demonstrate some purpose, and encode the time of the next announcement. The next one that doesn't follow the Mayday pattern is 4/19/83. Twenty months ahead, the nineteenth day. sight-translated it from memory, or from the available library sources (or from their own personal copies). first non-regular annoucement (with 19, the row number being its date of publication). Juls's remarks about the fish symbolism also seem apt here. �gyptians and Iudeans all were in Scotland. Edinburgh is Jerusalem, that is the secret kept from you. into the truth would overwhelm you and here is the first solution. These references can be found in Aleister Crowley's book Sepher Sephiroth and 'Godwins Cabalistic Encyclopedia'. A half (1/2) of 834 is 417 - Noah's Ark. This secret was held by the �gyptians - the Gypsies of Galloway, Scotland. Search David MacRitchie on Gypsies in Amazon. I have to go now. More clues on the next clue to follow. communications but I think the Freaks have confirmed that they make recourse to the Kabbalah on occasion. as a source of truth. perhaps referring to themselves as 'the fish', i.e. repressed masses/the working class. Pisces (and the age of Pisces) perhaps this is referring to the coming of the next age (Aquarius) "soon"? find it interesting that references to South Africa come up since the Zulu are located in Southern Africa. referring to Map published in 1974 by Thomas g magner from/for Penn state. If you look up Penn state you will see the coat of arms/logo there is a "fish" on it. Check out Wikipedia on Penn state. everything this group is discussing/meeting about. -ramblings from a bored humanoid. bhance: FWIW we've never found any conclusive proof that these ads relaetd to any other schools. UofA only. And I don't see a map at the wiley.com link? The link was not to show a map, but show a MAO reference.